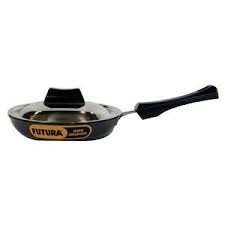 The extra thickness of the Futura Hard Anodised Frying Pans helps you cook without burning with minimal heat control. The instruction manual which comes with each frying pan gives easy tips for use and care as well as tested recipes. The handles, whether plastic or stainless steel, are stay-cool and comfortable. The frying pan with rounded sides has extra height to prevent spilling of food while stirring. The Tadka Pan (Spice Heating Pan) is designed for quick heating of flavourful spices and is also useful for melting butter or reheating small quantities of food.